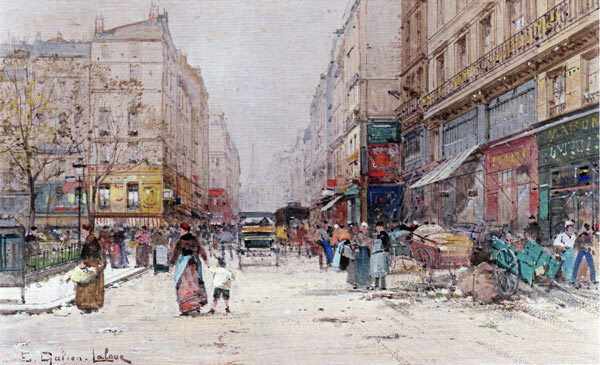 In 1135, Louis VI had a market settled in the center of Paris. In 1183, Philippe-Auguste had two buildings erected for the Saint-Ladre fair. From 1852 to 1870 Baltard had them replaced with ten metallic blocks, that were to be called “the belly of Paris”. « In the still of the night and the desert of the avenue, the farmers’ carts jolted up to Paris along the façades of silent houses standing in a straight line behind the dim shapes of the elm-trees. Their even-rolling wheels echoed in the streets. A cabbage-loaded cart and a wagon of peas had joined the eight carts of turnips and carrots coming down from Nanterre. The horses knew their way and were walking slowly at a lazy and commander pace. Their heads hanged low and their movements were slowed by the steep road. Above, on the piles of vegetables, the carriers, covered with their black-and-grey-pin-striped capes lay flat on their stomachs, dosing, the reins around their wrists. 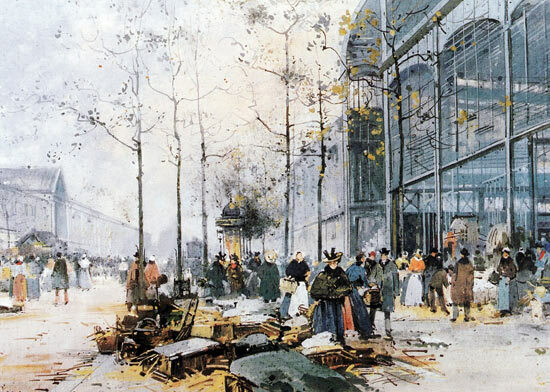 A magnificent gouache depicting the Paris of the 19th century. 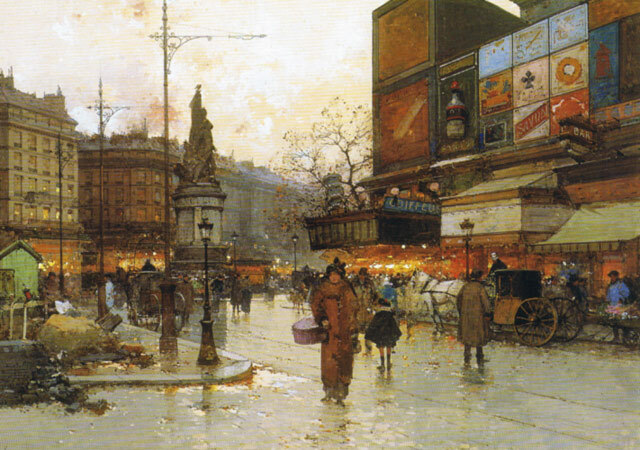 Note the large size of the canvas, the details on the painting – particularly the advertisements and the horses, rarely seen in Laloue’s works, the light and the typical Parisian lady encountered so often.